Activists Sue U.N. Over Cholera That Killed Thousands In Haiti : Shots - Health News A cholera outbreak in Haiti was likely triggered by United Nations peacekeeping forces stationed there after a 2010 earthquake. A human rights groups wants the U.N. to take responsibility for the cholera outbreak and to compensate Haitian families. Haitians protest against United Nations peacekeepers in Port-au-Prince in 2010. 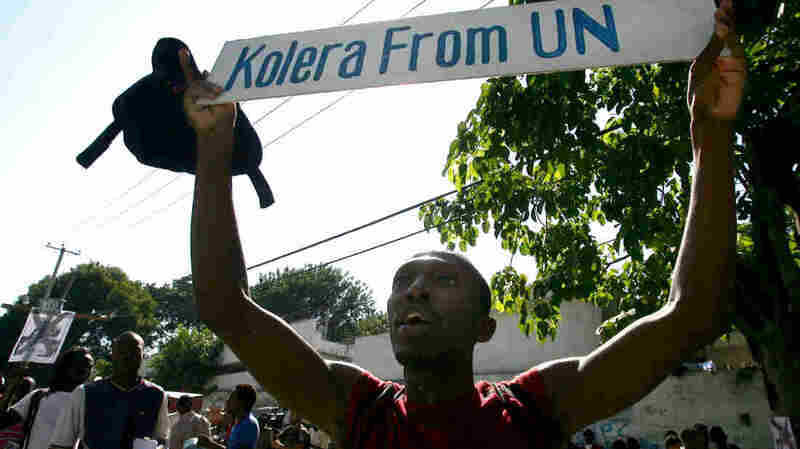 Human rights activists are suing the United Nations on behalf of five Haitian families afflicted by cholera — a disease many believe U.N. peacekeeping troops brought to Haiti in the aftermath of the devastating 2010 earthquake there. The lawsuit, filed Wednesday in a New York federal court, challenges the U.N.'s claim that it's immune from lawsuits arising out of damage done in the course of its activities. The activists say they have no choice but to sue because the U.N. has failed to activate a process that is supposed to deal with such claims. The suit doesn't specify the amount of compensation the plaintiffs seek. "Most legal observers are pretty confident that the U.N.'s absolute immunity is endangered," Brian Concannon, one of the plaintiffs' attorneys, said in an interview with Shots earlier this year. "It certainly has not happened yet, but many people say if there's a case that would do it, it's this one because the liability is so clear and the harm is so great." There's no disputing the harm that cholera has brought to Haiti. The epidemic there has become the world's largest and fastest-spreading one involving cholera. The Boston-based Institute for Justice and Democracy in Haiti, which Concannon directs, says more than 685,000 Haitians have been sickened by cholera since October 2010. That's almost 7 percent of the population. About 8,400 Haitians have died of cholera, a disease unknown in Haiti for at least a century before 2010. About 1,000 more die of cholera every year, with no end in sight. "The biggest national cholera outbreak in modern times is still not under control, and it's happening right on America's doorstep," says Dr. Edward Ryan of Massachusetts General Hospital, a past president of the American Society of Tropical Medicine and Hygiene. The society published a special issue of its journal Wednesday on the Haitian cholera epidemic. As to the U.N.'s responsibility, a series of studies point toward cholera's introduction by infected U.N. peacekeeping forces who arrived in Haiti just before the outbreak. The epidemic emanated from a U.N. camp with documented sanitation deficiencies in Haiti's central highlands. And the cholera bacteria spread down the Artibonite River system into which the camp's sewage was discharged. Scientists have shown that the cholera strain, which has now spread throughout Haiti, comes from a single source. And the strain is almost identical to the bug that was circulating in Nepal in the summer of 2010, as an expert panel commissioned by the U.N. concluded in 2011. The Haitian and Nepalese cholera strains differ in only 1 out of 4 million genetic elements, Tufts University environmental engineer Daniele Lantagne, told Shots earlier this year. Lantagne served on the independent panel investigating the outbreak for the U.N.
"Part of the reason we think the outbreak grew so quickly was the Haitian population had no immunity to cholera," Lantagne says. "Something like when the Europeans brought smallpox to the Americas." Former President Bill Clinton, during a visit to Haiti in the spring of 2012, said that the U.N. troops were "the proximate cause of the cholera," but he said Haiti's poor sanitation and health infrastructure amplified the disaster. The U.N. has rebuffed attempts by Haitian advocates to get the agency to compensate cholera victims. In February of this year, U.N. Secretary-General Ban Ki-moon ruled that such claims are "not receivable" under the "privileges and immunities" provisions in the U.N.'s charter. In a statement at that time, Ban expressed his "profound sympathy for the terrible suffering caused by the cholera epidemic. He also called "on partners in Haiti and the international community to work together to ensure better health and a better future for the people of Haiti." In an address to the U.N. General Assembly last week, Haiti's Prime Minister Laurent Lamothe said the organization bears a "moral responsibility" for the cholera outbreak. He complained that efforts to stem the epidemic have been far from adequate. The U.N. has a $2.2 billion plan to improve Haiti's sanitation systems and provide clean water — the only way to stem the ongoing cholera epidemic. But only a fraction of the money has been raised so far. A report last summer from the Yale Law School noted that the U.N. has a mechanism to deal with complaints of injury caused by U.N. operations under the so-called Status of Forces Agreements that govern peacekeeping operations. But the U.N. has refused to activate that process, the report said. Ira Kurzban, one of the attorneys representing the Haitian plaintiffs, said in a press statement that his clients expect the U.N. to argue that U.S. federal courts have no jurisdiction to hear the case. "We are prepared for that challenge," Kurzban said.